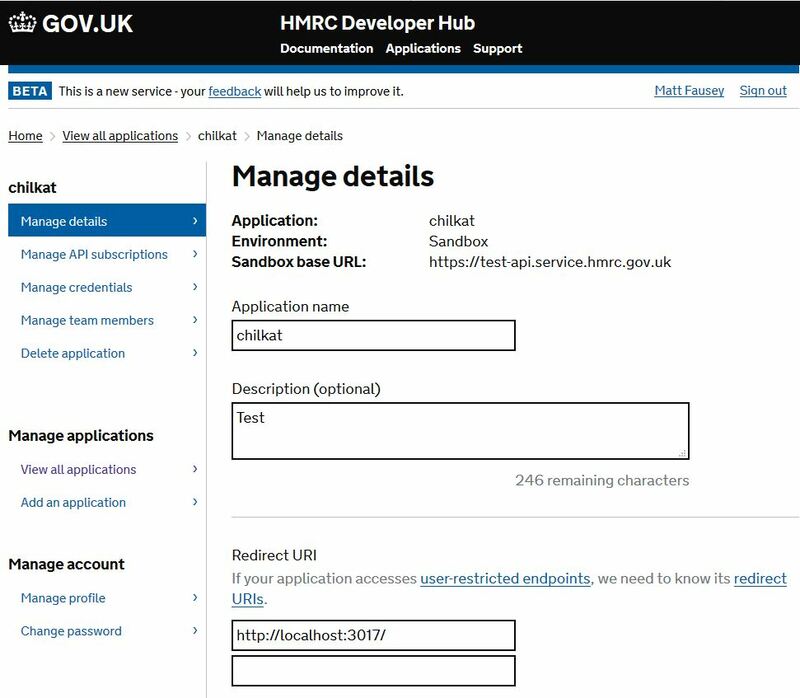 Demonstrates how to get an HMRC OAuth2 access token from a desktop (installed) application or script. This example gets an HMRC MTD VAT read/write access token.
' This should be the port in the localhost callback URL for your app.
' is exactly "http://localhost:3017/". Don't forget the ending "/" char.
' The callback URL would look like "http://localhost:3017/" if the port number is 3017.
' Replace these with actual values.
' The scopes are documented in the HMRC reference documentation for each API.
' This example gets a read/write access token for the HMRC MTD VAT API.
' Begin the OAuth2 three-legged flow. This returns a URL that should be loaded in a browser.
' At this point, your application should load the URL in a browser.
' The GitHub account owner would interactively accept or deny the authorization request.
' Now wait for the authorization.
' We'll wait for a max of 120 seconds.
' the AuthFlowState will be equal to 1 or 2.
' 1: Waiting for Redirect. The OAuth2 background thread is waiting to receive the redirect HTTP request from the browser.
' 2: Waiting for Final Response. The OAuth2 background thread is waiting for the final access token response.
' In that case, cancel the background task started in the call to StartAuth.
' 3: Completed with Success. The OAuth2 flow has completed, the background thread exited, and the successful JSON response is available in AccessTokenResponse property.
' 4: Completed with Access Denied. The OAuth2 flow has completed, the background thread exited, and the error JSON is available in AccessTokenResponse property.
' 5: Failed Prior to Completion. The OAuth2 flow failed to complete, the background thread exited, and the error information is available in the FailureInfo property.
' getting the current system date/time and adding the "expires_in" seconds.
' This way we'll know when the token expires.
' Save the JSON to a file for future requests.